Colored pencils and oil pastels on paper + computer generated. An illustration for the cover of the book: “Everything Is Illuminated” by Jonathan Safran Foer. This illustration is part of a series I made for this book, here is another one: https://artbydina.wordpress.com/2010/05/21/the-bead-of-condemnation/. 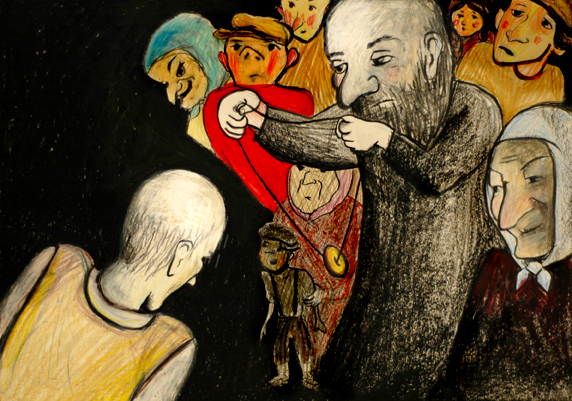 The jewish villagers in this forgotten shtetl which name is a story by itself (Trochenbrod or Zofiówka), are the theme of the background with their grotesque expressions. I enjoyed doing this cover because of the portrait freedom I could use here, while usually I stick to the realistic look. There is something strong in cover illustration, it must be specific and communicative – to make it this way, and still be interesting is a unique art by itself. Oil pastels on paper. An illustration for the book: “Everything Is Illuminated” by Jonathan Safran Foer. Yankel is being condemned by the society, and the punishment is to wear a bead to remind him of that. This illustration is part of a series I made for this book, here is the book cover: https://artbydina.wordpress.com/2010/05/30/book-cover-illustration-for-%e2%80%9ceverything-is-illuminated%e2%80%9d/. 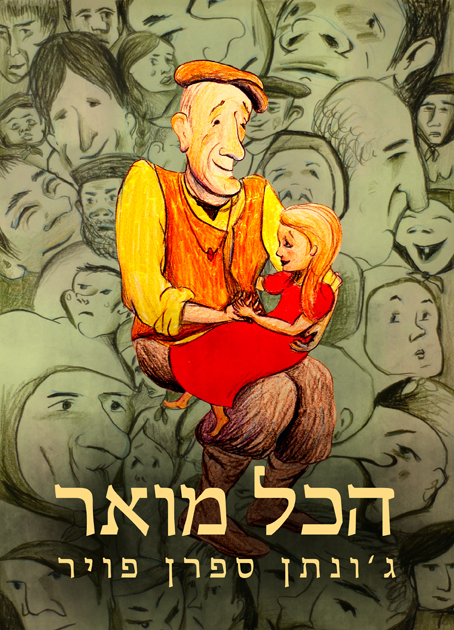 I really liked reading it, and it inspired my imagination, especially about the appearance and behaviour of the jewish villagers in this forgotten shtetl which name is a story by itself (Trochenbrod or Zofiówka).